To analyze and plan for Team Foundation Server security, you must consider the Team Foundation application tier, the Team Foundation data tier, the Team Foundation client tier, Team Foundation Build, Team Foundation Server Proxy, and the interactions between these entities. You will have to know what Web services, databases, and object models are used. Also, you must know which network ports and protocols are used by default, and which network ports are customizable. Besides its own services, Team Foundation Server depends on other services in order to function. For more information about Team Foundation Server dependencies, see Team Foundation Server Security Concepts. Team Foundation Server includes an object model that enables communication between the Team Foundation client tier and the Team Foundation application tier. This object model also enables software integrators and third parties to customize and extend Team Foundation Server functionality. The Team Foundation Server object model is a set of managed APIs that include the following interfaces. The Team Foundation Server object model is publicly documented in the Team Foundation Server extensibility documentation in the Visual Studio SDK. 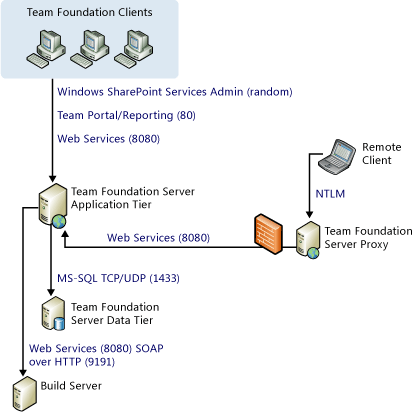 Team Foundation Server includes a set of Web services and databases. These services and databases are installed and configured separately on the Team Foundation application tier, data tier, and client tier. The following figures provide a high-level view of Web services, applications, and databases on Team Foundation Server and on client computers. 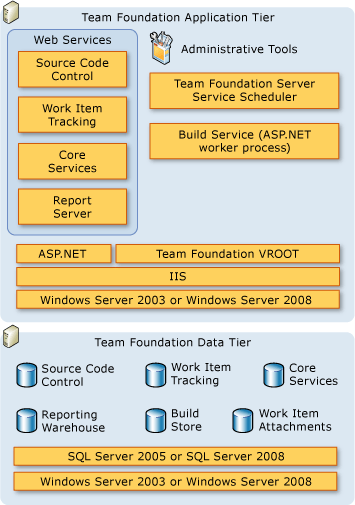 The Team Foundation application tier contains the following ASP.NET Web services that correspond to respective proxies or object models on the client tier. These Web services are not intended for third-party integrators to program against. One exception to this policy is the MSBuild Web service that is documented in the Team Foundation Server extensibility documentation in the Visual Studio SDK. The Team Foundation data tier consists of the following operational stores within SQL Server 2005. This includes data, stored procedures, and other associated logic. These operational stores are not generally intended for third-party integrators to program against. The client tier uses the same Web services listed in the application tier to communicate with the Team Foundation application tier. It communicates through the Team Foundation Server object model. Besides the Team Foundation Server object model, the Team Foundation client tier consists of Visual Studio Industry Partners (VSIP) components, Microsoft Office integration, command-line interfaces, and a check-in policy framework for integration with Team Foundation Server and customized integration. For more information about how to extend and customize the client tier, see the extensibility documentation in the Visual Studio SDK. When maintaining an Team Foundation Server deployment, you must take these configuration sources into account. To change the configuration in any way, you must modify information that is stored in multiple locations on the application tier. You must also change configuration information on the data and client tiers. Team Foundation Server includes a number of command-line utilities to help you make these changes. However, in some cases you need to make manual changes as well. Active Directory synchronizes with Generic Security Services (GSS), which then synchronizes with Team Foundation Server. Changed identities are propagated from the server to the clients. Depending on the synchronization interval configured in the web.config file and the nature of the change to groups and users, it might take some time for changes to Active Directory users and groups to be reflected across Team Foundation Server. Team Foundation Server has its own set of default groups. Also, it has permissions that you can set at multiple levels. You can create custom groups and customize permissions at group and individual levels. However, when you add a user or group to Team Foundation Server, that user or group is not automatically added to two components on which Team Foundation Server depends: Windows SharePoint Services and SQL Server Reporting Services. You must add users and groups to those programs and grant the appropriate permissions before those users or groups will function correctly across all Team Foundation Server operations. For more information, see Managing Users and Groups, Managing Permissions, Windows SharePoint Services Roles and SQL Server Reporting Services Roles. By default, Team Foundation Server is configured to use specific network ports and network protocols. The following diagram illustrates Team Foundation Server network traffic in an example deployment. By default, communication between the Team Foundation application tier, the Team Foundation data tier, build computers, and the Team Foundation Server proxy, use the protocols and ports in the following list. If an asterisk (*) follows the port number, you can customize that port. You can modify Team Foundation Server to use some custom ports. You can change communication between the application tier, the data tier, and the client tier, as noted in the previous table. As an example, the following table describes changes in ports from HTTP to HTTPS. Configuring Team Foundation Server to use HTTPS and SSL is a complex task that involves much more than enabling ports for HTTPS network traffic. For more information, see Securing Team Foundation Server with HTTPS and Secure Sockets Layer (SSL).